We have prepared for you an exciting event with rich scientific content that will keep all attendance with a remarkable experience. The scientific program of SHA27 has been thoroughly planned by the Sub-Committee Chairmen and member representatives of different working groups as directed and supervised by the Saudi Heart President, Dr. Khalid AlHabib. The SHA27 program mainly begins on the first day with a series of workshops in 7 different tracks in addition to abstract presentations and nomination of Prof. Mohammed Al-Faqih Award winner. The second day of the program highlights sessions collaborated with International organizations such as ESC, EACTS, PACHDA, ASNC/EACVI, Egyptian Society of Cardiology and other sessions from the different specialty. The third day of the event continues the international joint sessions from American College of Cardiology, Gulf Heart Association, Canadian Cardiovascular Society & Turkish Society of Cardiology.Fore/part on the third day is the Plenary Session in the morning with invited international guests. 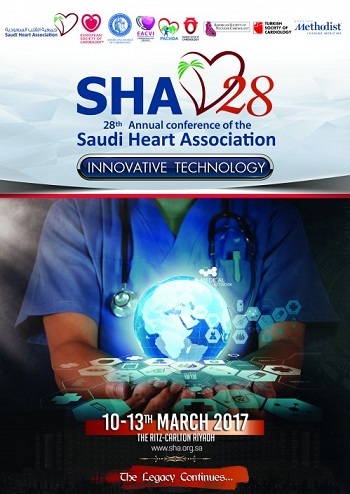 SHA27 comes up with more than 60 sessions, 17 tracks including Cardiac Surgery, Cardiac Anesthesia & Critical Care, Cardiac Imaging, Echocardiography, Cardiac Nursing, Cardiac Technology, Electrophysiology, Preventive & Rehabilitation Cardiology, Heart Failure, Adult Congenital Heart Disease, Interventional Cardiology, Pediatric Cardiology, Fellows & Registrars Workshops, Research Workshops and CPR. We have also received more than 200 Abstracts in different specialties. There are more than 200 consultants and speakers to participate in SHA27 from USA, Europe , Asia, Australia, Africa, Arab & Gulf countries and the Kingdom. SHA27 provides a wide-ranging opportunity for all Cardiac Physicians, Cardiac Specialists, Nurses, and Cardiac Technologists with regards to new and advance cardiac practices simultaneously set in different specialties. On behalf of the SHA27 Scientific & Organizing Committees, we wish that everyone will enjoy this Symposium conducted for the Second time in the fascinating venue The Ritz-Carlton Riyadh.